Twos Day: If you’re a sheep, I’m a sheep! This Twos Day (two are better than one), the topic of leadership has been wrestling around in my mind. As young women, we love to watch romantic movies…get swept away…and look for that leading man to sweep us off our feet and lead us to a castle where we can live happily ever after. At this point, our hearts are melted, our attention has been captivated, and we are all swooning over this romantic love story. While in this particular movie it is the girl telling him to be something, it can go both ways. What I have found to be true in love and relationships is that we often become like one another. Statistics show that you start becoming similar to the 5 people you spend the most time with. Knowing this, if we are infatuated, in love, crazy for someone, and spending every minute with them, who are we becoming? A couple Twos Days ago, I talked about the most important qualities that we tend to look for in our “perfect guy.” Being engaged, I have found that it is crucial that I learn to let my fiance lead and make decisions. Not only does it build him up, encourage him, and make him feel respected, but it is good for me to be selfless, trusting, and get over my stubborn ways. Looking for the right qualities in a guy you want to spend time with also means looking at what kind of leader he may be. What decisions does he make on his own? Are they good ones? Does he have high standards for himself? Does he have ideals and morals even when no one is reminding him? Something I always found so attractive about my fiance was that he wasn’t just a “good guy” because he was in a relationship. I knew that on his own, separate from me, he would still have the same strong morals, ideals, and would continue making the right decisions. I give my fiance the privilege and honor of leading me because he is godly, trustworthy, respectful, and constantly asking for God’s guidance. 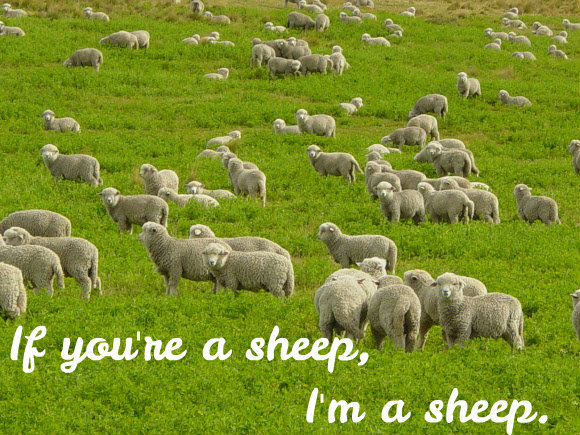 God is so clearly his shepherd who leads him and keeps him in line, so if my fiance is a sheep, he inspires me to be one, too! -Does he make me love God more? -Does he inspire me to have more faith? -Does he have strong morals and ideals not out of rules, but because he firmly believes in them? Etc…etc…etc. Reading that list above, are those things that you say to God? Are you telling God that you’ll follow Him anywhere, be His girl, and do whatever it takes? Do you realize that you need Him? Is He everything to you? I was always stubborn, used to doing things my own way, and accustom to living alone. If you are reading this and you are hoping and praying to someday find the man of your dreams, I can promise you that if you can’t learn to allow God to lead you, you won’t let any boyfriend, fiance, or husband lead you, either. Reading the words above that Jesus spoke, do you feel that you are one of His sheep? The best practice for learning how to be lead, how to submit, and how to be respectful to anyone and any authority is to start with the most important…Jesus. Take that exciting, adventurous, heart pounding, thrilling feeling of “The Notebook” romance and transfer it to God this week. Be the sheep. Follow Him. Previous postGluten Free Power Pancakes! Next postGet the natural, fresh, boho-chic look! what a wonderful, big, lovely heart God has given you. You make me want to love God more!